So the great Job Scam of 2018 has happened. I told you a little about it last week and I am not going to go into to much detail this week, but I am almost over it. I still have to file some police reports though. I am going to write an article over on ABustlingHome.com about how to stay safe when your looking for a side hustle on line. It turns out that there are way more scammers out there than I ever thought of. The good news is I didn’t loose any money. I figured them out before they were able to get anything from me. I did have to change my bank account though. I had that account for the last 20 years. It is where my monthly disability check from the Army goes. Do you know how hard it is to get that changed? I hope they catch the scammers and they get roommates named Bubba who like to cuddle more than they like to wear clean under wear. Just sayin. This week I have been working on 3 things. The main thing is my Lavender Fields Blanket. I thought I had it all done after the second round of green. When I put it on the bed however it only covered the exact top. So I added another round of the purple (which added 4 rows of color) so that there is some overhang. I know that the yarn is going to soften after I wash it and it will hang a little further so it is awesome. Now I just have to go tuck all those tails. Look for a post on the whole process this month. Fun note on this blanket: I shared a picture of it in the Facebook group Marly’s Minions in a WIP thread. I had at least 5 people ask where I got the pattern and ordered the book on Amazon that day. I love sharing my projects and inspiring people. I am thinking of making this blanket in a baby size and selling it in the store. What do you think? The second thing I worked on this week was a CAL from the Facebook Group Marly’s Minions. She hosted a Game Day Mystery CAL. There were over 3000 people trying to participate and it crashed her site. After they figured out how to get the hourly clues out to people it was a lot of fun. I finished my cowl during the Superbowl and I love it. I put up a picture to enter for a prize pack from Red Heart (she is their National Spokesperson). I didn’t win a pack but my picture did make the roundup picture! She is going to be putting the finished pattern up either on her website as a free pattern or in her Ravelry shop. I am not sure which, when I find out I will let you know. The third thing I have been working on this week is the Solar System CAL. Mainly I have been working on it in the school pick up line. I have been checking out others photos on Instagram though and I am loving how the blanket is developing. I still think if i ever make another I would use the dark blue for space not the black. I have a new podcast for you. It is Style your Mind by Cara Alwill. I have been branching out from just crafty podcasts to include ones on books, self help, style, blogging, and awesome women. This one has quickly become one of my favorite. She is a life coach in New York City. She is so stinking awesome – I can’t even tell you. She is all about empowering women to be their best self. She covers everything from self empowerment, life in New York, standing up for yourself to get what you deserve, and so much more. I have been binging on her podcast for the last week or so and I feel like I could track down those scammers myself and deliver them to their new friend Bubba. My Find of the Week is less of a find and more of a happy announcement. I have found some new affiliates. Annie’s Attic, Leisure Arts, and Sulky Threads. I am going to be adding their banners to the bottom of my posts, so if you shop with them please click thru my link! Remember if you click on an affiliate link it doesn’t cost you a thing, but I get a very small percent of the total sale to help get materials to generate new content for you. Yall know how expensive these hobbies are. I talked to the Social Media Manager at Annie’s this week and she is going to sponsor a giveaway here on BlinkingCat! I am going to set it up this week and open it up for entries through the end of the month. It is going to be for any 1 pattern out of their spring look book (a pdf download). *Hey if we get over 100 entries there will be 2 winners! So when I post the giveaway page share it with all of your crafty friends! 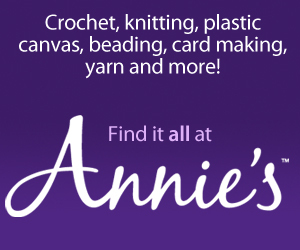 Next Next post: Annie’s Catalog Giveaway!! !